The Reverend George L. Fox, Rabbi Alexander D. Goode, the Reverend Clark V. Poling, and Father John P. Washington were classmates during one of the school’s first-year sessions in Cambridge. They were reunited in January 1943 in New York City, assigned to sail for Europe on the SS Dorchester, a troop ship carrying almost a thousand men. On February 3, not long after midnight, a torpedo struck; the ship’s electrical system was destroyed, frigid water poured in, and the vessel sank within 27 minutes. 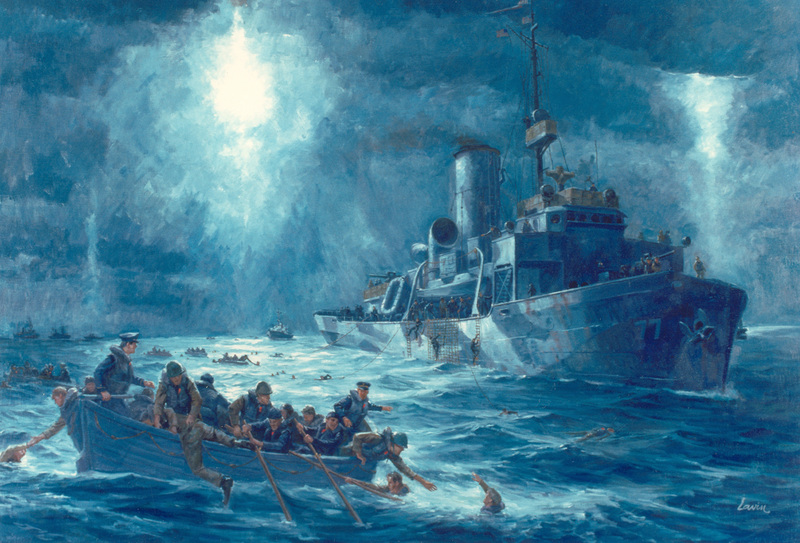 During that scant half hour, the four chaplains worked in the darkness to organize an orderly evacuation of those trapped below deck, to get men into lifeboats, and to distribute life jackets. When the supply ran out, they gave away their own. Survivors reported seeing the four of them, arms linked, braced against the ship’s railing, singing hymns and reciting prayers as the Dorchester went down. Because the chaplains’ actions did not occur during “combat with the enemy,” they were ineligible for the Medal of Honor, which many felt they deserved. 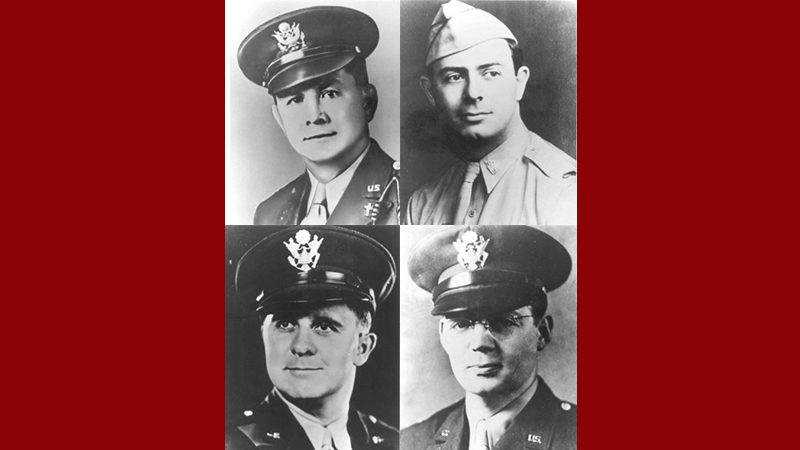 On July 14, 1960, an Act of Congress approved the Four Chaplains Medal, awarded for extraordinary heroism. Only four were struck; these were presented in 1961 to the chaplains’ next of kin. As one of three chaplains on duty when 241 men died in the bombing of the U.S. Marine barracks in Beirut in 1983, the rabbi was himself later honored, with his Catholic and Protestant colleagues, by the Four Chaplains Memorial Foundation. His presence lent further solemnity to the dedication of a plaque, newly affixed to the north wall of the sanctuary, memorializing his four predecessors. The tablet joins others installed there within the past decade under the auspices of the HVAO, including a tribute to the University’s Medal of Honor recipients. President Drew Faust, a veteran’s daughter, attended the service, and HVAO’s founder, Tom Reardon ’68, thanked her warmly for welcoming the Reserve Officers’ Training Corps back to campus in 2011 and for her support of service members and veterans enrolled at the University. His remarks also announced a further step to continue links between Harvard and those who serve in the military: the College has joined a national mentoring effort that encourages and supports veterans seeking an undergraduate degree. The three-year, preliminary affiliation with Service to School’s VetLink program is supported by Reardon and a fellow Vietnam veteran, Bruns Grayson ’74. Read the Harvard Gazette coverage here.